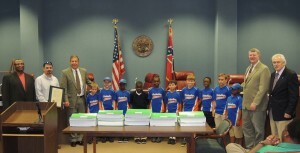 The Board of Supervisors recognized and commended the Hattiesburg Americans 8 year old baseball team for reaching the championship game of the 2012 Dixie Youth Regional World Series in Searcy, Arkansas. The team won 6 of 9 games played over a three day span. Prior to reaching the World Series, the Americans amassed an undefeated record of 21-0 and won the State Tournament held in Magee. Team Members: Joey Acosta, Matthew Adams, Jermel Ford, Timothy Hunt, Antonio Johnson, Nick Lee, Collin Necaise, Levi Odom, Landon Scott, Channing Ware, Luke Wiest and Blake Wilberding. Coaches: Jay Acosta, Mark Necaise, Dontae Scott and Cliff Wilberding. 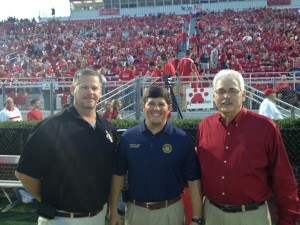 “Taking part in the Pre-Game Activities at the September 27th Oak Grove vs Petal football game, are Congressman Steven Palazzo- MS 4th Congressional District, District 4 Supervisor Lamar County- Phillip Carlisle, and District 3 Supervisor Forrest County- Burkett Ross”. 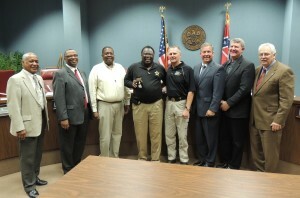 Chief Charles Bolton is presented with the 2012 Forrest County Officer of the Year Award. This award is presented annually to the law enforcement and firefighters by the Hattiesburg Exchange Club.